IPL 2013 Opening Night Kolkata Tickets, IPL 2013 Opening Nite Kolkata Program Tickets, IPL 2013 Opening Ceremony Salt Lake Stadium Entry Tickets, Buy Tickets of IPL 2013 Opening Ceremony Salt Lake Stadium Kolkata, ticket available centre names in Kolkata for 2013 IPL Opening Ceremony. Since, Kolkata Knight Riders (KKR) has won the 2012 Indian Premier League (IPL) tournament; thus the IPL 2013 Opening Ceremony program, 1st match and IPL 2013 Final match will be organized at Kolkata, home ground of KKR team. IPL 2013 T20 Cricket Tournament is about to begin on 3rd April 2013 at Eden Gardens, Kolkata [Check KKR matches in IPL 2013 and full match fixture of IPL 2013]. But, the Grand Opening Ceremony of IPL 2013 will take place at Salt Lake Stadium of Kolkata instead of Eden Gardens. Here we will check out few details regarding IPL 2013 Opening Ceremony (Program). The Grand event ‘IPL 2013 Opening Ceremony’ is on 2nd April 2013 [Tuesday] at Vivekananda Yuva Bharati Krirangan (Salt Lake Stadium), Kolkata 7:30pm onwards. It’s going to be a grand opening program where celebrities from Bollywood & Tollywood will perform along with International celebrity Pitbul. 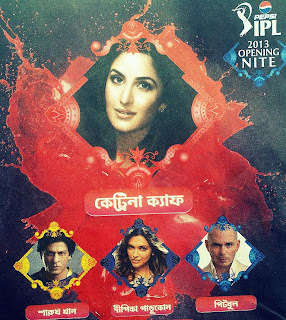 Opening Nite of IPL 2013 at Salt Lake, Kolkata is an event that you can’t miss. It will be a great experience to see International Star Pitbul, King Khan Shahrukh, Bollyqueen Katrina Kaif, Deepika Padukone & other celebrities from Mumbai performing live in front of you. • Buy IPL 2013 Opening Ceremony Tickets Online – You don’t need to go outside; only thing you require is Internet. You can Book Online Tickets of IPL 2013 Opening Ceremony through www.iplt20.com website. Salt Stadium Gate-4 Ticket Counter – IPL 2013 Opening Ceremony Ticket Counter name in Kolkata. Mohammedan Sporting Club Ground, Near Eden Gardens, Kolkata – IPL 2013 Opening Ceremony Ticket Counter name in Kolkata. The Mobile Stores [City Centre Salt Lake, Kalindi, Tollygunj, City Centre New Town, Dalhousie and Park Street] – IPL 2013 Opening Ceremony Ticket Counter name in Kolkata. Café Coffee Day [Ballygunj, Globsyn Building Salt Lake, Gariahat, Elgin Road, and Rowdon Street] – IPL 2013 Opening Ceremony Ticket Counter name in Kolkata. Music World Park Street – IPL 2013 Opening Ceremony Ticket Counter name in Kolkata. Reebok [City Centre-I, Salt Lake] – IPL 2013 Opening Ceremony Ticket Counter name in Kolkata. Fundamental City2 Bobo, City Centre, New Town, Shop No.A00008 – IPL 2013 Opening Ceremony Ticket Counter name in Kolkata. Joy Ma Enterprise, AC 93/A Prafulla Kanan, Kolkata-101 – IPL 2013 Opening Ceremony Ticket Counter name in Kolkata. Camac, 3A Camac Street, Kolkata -17 – IPL 2013 Opening Ceremony Ticket Counter name in Kolkata. The inauguration program of IPL 2013 will begin at 7:30pm in the evening at Salt Lake Stadium and the Gates will be opened at 4:30pm (afternoon) for the people to get entry in time. Are you coming to Salt Lake Stadium to watch IPL 2013 Opening Ceremony Live? Check KKR Matches of IPL 2013, IPL 2013 KKR Match Dates & Timings and Full IPL 2013 Match Schedule.